The linear motion system plays a vital role in any linear CNC machine, and CNC routers are no exception. Without these systems coupled with a drive system, a CNC router would be of little use. The LM system is responsible for three primary tasks. A LM system is composed of some type of linear bearing and the linear bearing guides. There are a number of types of bearings and guides, each with advantages and disadvantages. Because of the importance of this system, it is vital for a buyer a builder to be knowledgeable about the LM components. The linear motion system can make or break a machine. For people buying new CNC routers today, there should be little concerns regarding these components. 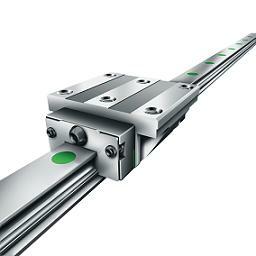 The quality and performance of linear motion slides have drastically improved over the last few years. Almost all of the new CNC router machines are using quality linear bearing systems. This holds true for mid-range to high-end models. . If you are buying hobby CNC routers or low end machines, it is still important for you to be able to identify quality systems. Some manufacturers do not specify what types of components are installed and you should know how to identify faulty systems.For those interested in buying a used system, you need to know what types of linear system are installed and be able to identify faults or at least know the right questions ask. It can cost $10,000 or more to replace a full set of linear bearings (depending on the system). If the system is older, the companies may no longer sell the parts. If you must replace a part you could be dead in the water. So it is important to be able to identify the components, know what faults to look for, and know whether or not the replacements are still in production. The LM system can be one of the most expensive and difficult features of a machine. That is why it is imperative to get it right the first time. If you are here following the step 3 in the builder's guide then I suggest your read through all the sections and not just the section on building your own. This guide will go through the many options you have for linear systems. It will discuss advantages and disadvantages of each and also show you how to build your own if you so choose. It will also include information on how to mount rails, linear shafts, and much more, including money saving tips and tricks. If you have any questions regarding LM systems, dont hesitate to contact us.